The Snapper Meunière is topped with buttery lump crab meat and bright capers, and served over a bed of veggies. Photos by Collin Richie. Downtown Baton Rouge has had its ups and downs when it comes to restaurant options. This year has seen a few closures. There have also been a few noteworthy openings, like Cecelia. The Creole bistro moved into the old Restaurant IPO location on Third Street in April. It seemed a slow night at Cecelia when we first arrived, yet music was blaring from the speakers. Thankfully, the music soon mellowed, and the crowd thickened to create a lively atmosphere. Offering cornbread as an appetizer seemed like an interesting concept. 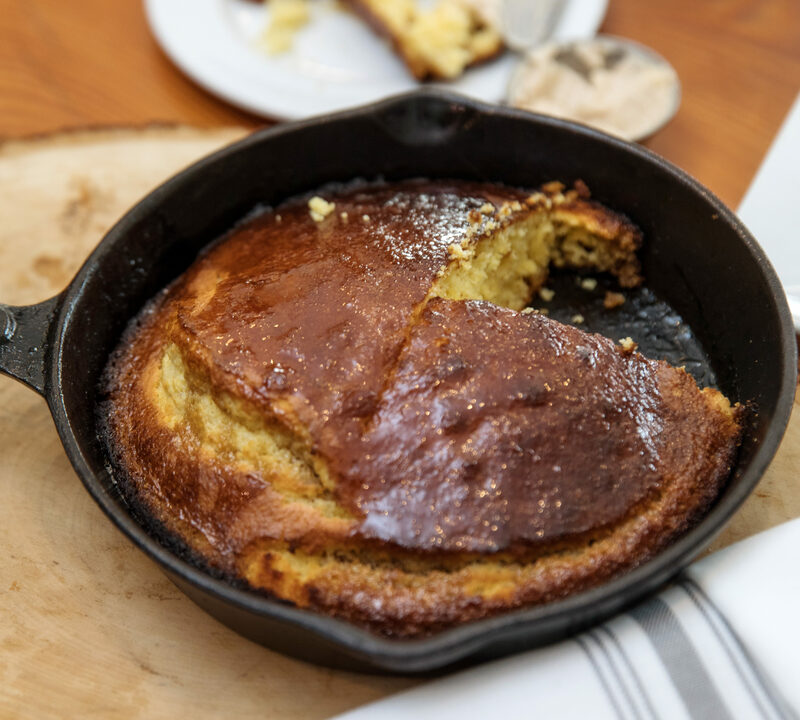 When I asked our server if we should order it, he shot me a look that said, “You’d be foolish not to.” Presented in a cast-iron pan, the Skillet Cornbread was no small snack. Eavesdropping on the adjacent table, we overheard diners describing it as akin to a dessert. My partner was reminded of pancakes. Once I made it past the overt sweetness of the maple-bourbon glaze, it was a rich, moist cornbread with an extremely tender crumb. We skipped the included side of cinnamon butter, though, and we eventually became preoccupied by what tasted like bacon grease coating the bottom of the pan. Our server seemed confident there was no bacon grease, but it was so strong a flavor that I wasn’t so sure. 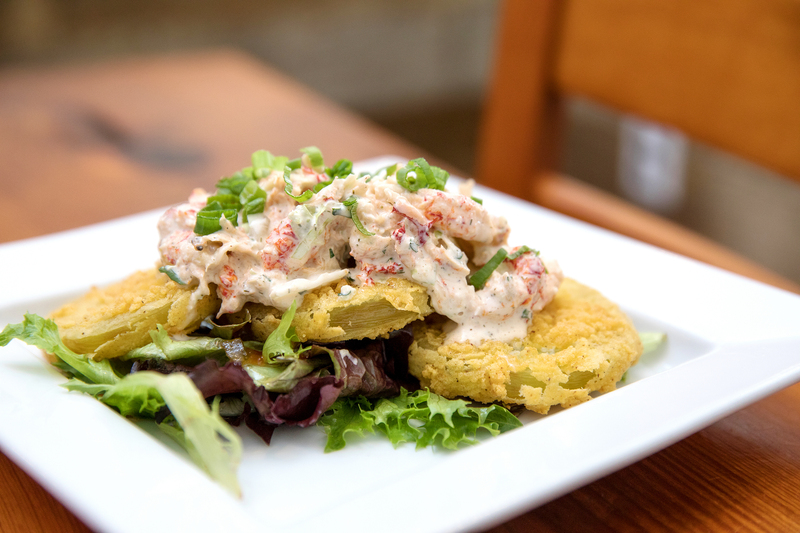 The Fried Green Tomatoes came highly recommended. It had unbelievably tender and abundant crawfish—so many in fact that we lost the green tomato. Once found, though, the tomato had a lovely tartness offering a great counterbalance to the spicy white remoulade sauce. Our server steered us toward the Cajun Redfish and Snapper Meunière as entrees. Served with maque choux, red pepper coulis and crawfish, the redfish had plenty of Cajun going on. The Crystal hot sauce butter was apparent throughout. There was a pool of crushed tomatoes underneath that tasted fresh and spicy. When I got a scoop of all the dish’s components, the tomato was a welcomed zesty element. The maque choux seemed to be just kernels of corn, but it had a sweetness that balanced the spice of the blackening seasoning and sauce. My Snapper Meunière was topped with lump crab and served with a mix of zucchini and red onion. There was almost too much butter on the crab, but bright capers punctuated each bite with welcomed tang. Pan-sautéed crispness added texture to the skin-on fish, while zucchini completed the serving with a much-needed vegetal component. We always ask restaurants which dessert offerings are made in-house. Answer: none of the three choices here. But all were made by a local baker/caterer. Red Velvet Bread Pudding was the top suggestion, and we found it too intriguing to pass up. With its muddy reddish-brown hue, we were a bit skeptical at first. But books and bread pudding shouldn’t be judged by their covers. This dessert was sublime. The slice was airy, almost soufflé-like, and slightly eggy. The icing on top—literally and figuratively—was a tangy sauce. Entrees ran around $14 to $25. Given the moderate prices, we expected reasonable serving sizes but were shocked by the enormity of the portions. Most of our meals ended up in boxes to take home. Kudos to our server who helped us navigate the menu with superb recommendations. To be steered to the best offerings by a knowledgeable staff member is a bonus in any dining experience. All in all, our meal was excellent. Let’s hope this downtown gem is here to stay. The basics: The same team behind Kalurah Street Grill at the Perkins Road overpass and Bengal Tap Room on Third Street took over the space next door to the downtown beer bar—formerly occupied by Restaurant IPO—for this Creole restaurant. Kalurah’s Kelley McCann helped craft the menu of traditional Louisiana dishes. The inviting interior with its unique dining booths and upscale vibe adds some class to the Third Street bar scene. 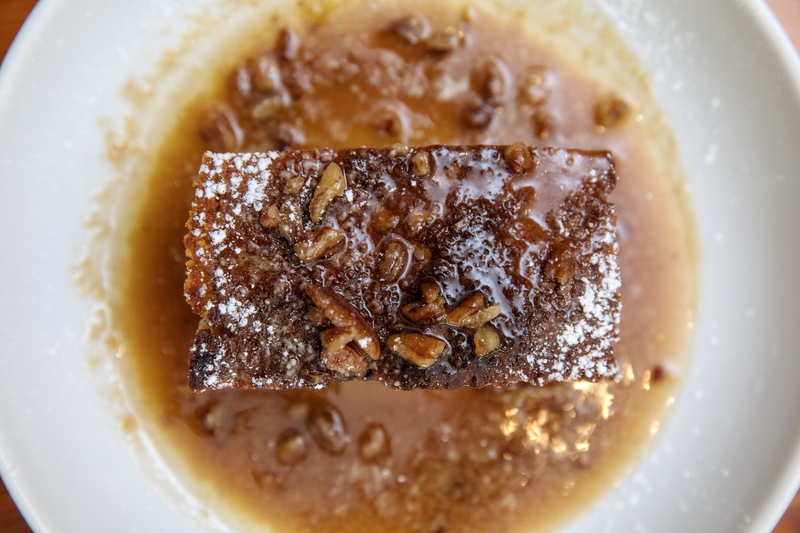 What’s a must: The Skillet Cornbread appetizer to start; the Fried Green Tomatoes appetizer, if you’re still feeling snacky; Redfish Cecelia, with its crawfish tails and zesty red pepper coulis; the sublime Red Velvet Bread Pudding to end the night.